Today’s animation is a groundstone wedge that was excavated in 1939 or 1940 as part of work relief archaeology at the Fort Hill site, a Monongahela village in Somerset County, Pennsylvania. It is now within the archaeological collections of The State Museum of Pennsylvania (TSMP). The exact function of this wedge is unclear, but it may have been a woodworking tool. 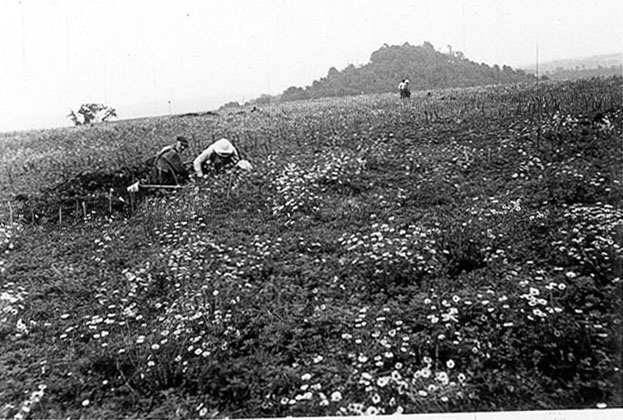 More information on the Work Projects Administration excavations at Fort Hill can be found here. Line of post holes at Fort Hill where wooden posts once stood. Today’s animation is a groundstone axe recovered archaeologically by Jamestown Rediscovery. 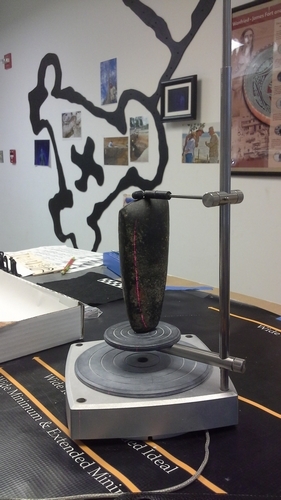 It was scanned on April 7, 2014, in the Jamestown Rediscovery laboratory. Today’s animation is a stone ball that was excavated in 1939 or 1940 as part of work relief archaeology at the Fort Hill site, a Monongahela village in Somerset County, Pennsylvania. It is now within the archaeological collections of The State Museum of Pennsylvania (TSMP). It was presumably used for game playing. 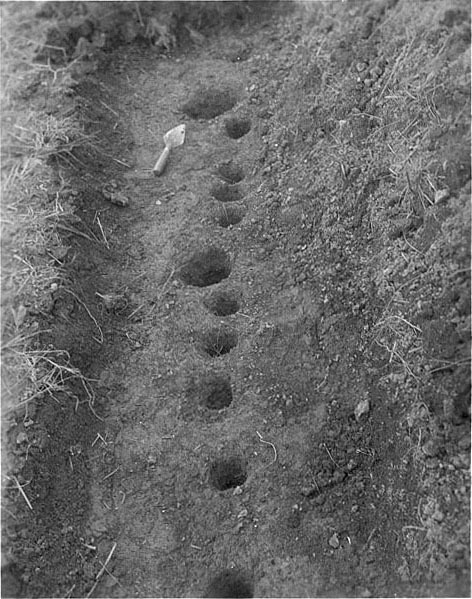 More information on the Work Projects Administration excavations at Fort Hill can be found here. 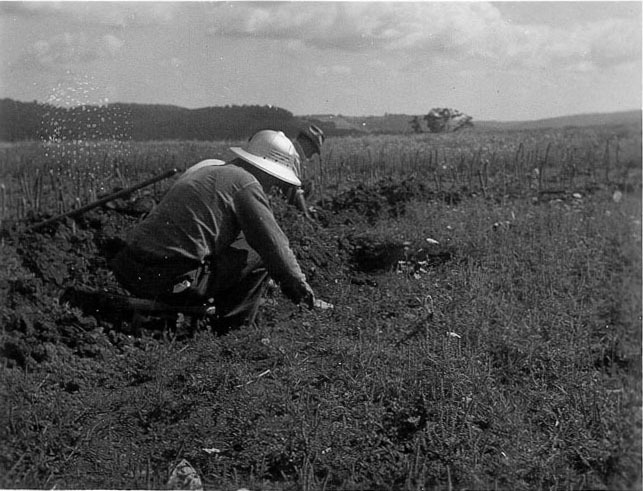 Excavating at Fort Hill in 1939 or 1940. Today’s animation is a chunkey stone that was excavated in 1939 or 1940 as part of work relief archaeology at the Fort Hill site, a Monongahela village in Somerset County, Pennsylvania. It is now within the archaeological collections of The State Museum of Pennsylvania (TSMP). Chunkey stones were used in the game of chunkey, where the goal was for two players to throw sticks close to where they expected the stone to come to rest after it had been rolled down a prepared court, without hitting the stone. This stone was damaged in play and repaired in the early 1940s for display. More information on the Work Projects Administration excavations at Fort Hill can be found here. 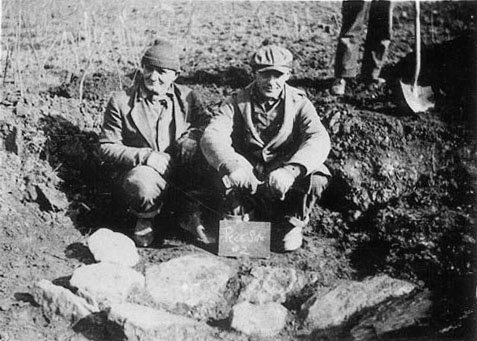 WPA excavations at Fort Hill. Image courtesy of The State Museum of Pennsylvania. Today’s animation is a cannel coal pendant from the Consol site, a Monongahela tradition village. It was recovered archaeologically by members of the Westmoreland Archaeological Society, a chapter of the Society for Pennsylvania Archaeology. It was scanned in June 2012. More on cannel coal pendants can be found in this post of a pendant from the Fort Hill site. Today’s animation is a groundstone object identified as a toy pipe. The pipe has a clearly developed bowl but the “stem” is solid. The toy pipe is also quite small at just over an inch in length. It was recovered archaeologically from the McKees Rocks site by a crew of Work Projects Administration archaeologists in the 1930s. The pipe is now in the archaeological collections of The State Museum of Pennsylvania. Three printed replicas of the pipe. Three printed replicas of the pipe held by Lauren Volkers. 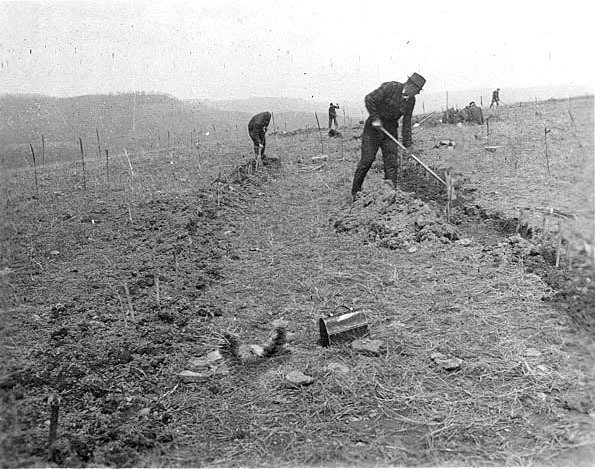 Today’s animation is a groundstone discoidal found in 1939 or 1940 by a Work Projects Administration (WPA) crew laboring at Fort Hill, a multi-component Monongahela tradition village site located in Somerset County, Pennsylvania. The flat, raised area on one face represents adhesive from a very early attempt to display this artifact in a public setting. It is now within the archaeological collections of The State Museum of Pennsylvania (TSMP). This particular object was scanned on January 20, 2012 in the VCL as part of a loan from the TSMP and with funding support from the Department of Defense (DoD)’s Legacy Program. Details on that DoD Legacy Program-funded project (11-334) can be found here.